Sweep Tight is giving away over $2400 in prizes to six winners in the 12 Days of Gifts Galore Giveaway event! Just look at all these fantastic prizes you can win! 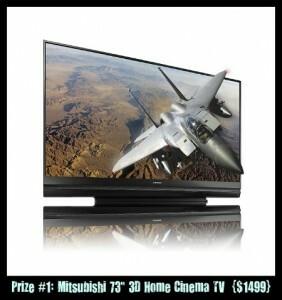 One lucky winner will receive a Mitsubishi 73″ 3D Home Cinema TV (WD-73640) – $1499 value! Four lucky winners will each get a DXG Luxe Collection 1080p HD Camcorder and a Nomad Mini brush – $219.98 value each! One winner will receive a Lovable Labels Christmas Jewels Holiday Pack – $24.95 value! The giveaway is open to US only and ends on 12/6. Visit Sweep Tight to enter the giveaway!